Home » Email vendor Selection Articles » What Is Marketing Automation And What Does It Yield? What Is Marketing Automation And What Does It Yield? Email has proven to be the most successful online marketing instrument. But sending emails will only get you so far. Customers will force 1-on-1 communication: as a marketer you will have to engage in dialogue in order to optimise conversion. Many marketers are looking towards Email Marketing Automation software, but what does marketing automation entail and yield? Customers are better informed and more critical than they’ve ever been. You customers expect you to know what they want and need. This is where marketing automation comes into play. Simply put, it allows you to offer your customers the right content at the right time, all automated. The better the content and messages are tailored to the individual customer, the higher your conversion rates will be. Describe Marketing Automation is best done by answering three questions: What is it? What does it enable? and very important: What does it yield?. Building customer profiles is an essential part of marketing automation. This is a dynamic process, not a static one: you don’t just look at your customer’s profile (female, age 21), but you also take into account what that person is doing. Which web pages is they visited, which subjects in emails do they think are interesting? Both explicit data (filling out a form) and implicit data (following someone’s behaviour) are used in building a profile of every customer. If you want to build these customer profiles this means you should consider which customer behaviour you would like monitor, track and use for your marketing. The marketing automation tool you select has to be able to store this data for you to access it for segmentation, personalisation and triggered messaging. The profiles help you in communicating 1-on-1. By using marketing automation software to set up an automated process, you can do so quickly and easily ‒ regardless of how many customers you have. It is possible to work on accurate segmentation, building lists and developing focused omni-channel campaigns in order to bring in customers, or to nurture them by offering relevant content. You can also manage the campaigns and measure the results in order to refine them even further. It’s a continuous process. Marketing automation can be highly beneficial, both for marketing and sales departments. 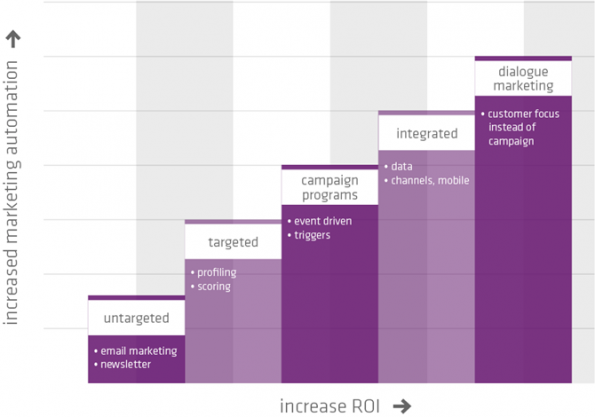 Marketing will be able to run more campaigns (and more effectively) with the same manpower. Sales will be able to work in a more focused manner, because they know which prospects are most likely to end up becoming a sale. The marketing automation software can also inform them about the best approach for a sales call. This leads to higher conversion rates. More importantly, sales will acquire more qualified leads. Finally, because of focused and tailored communication, fewer leads will be lost during the marketing process. 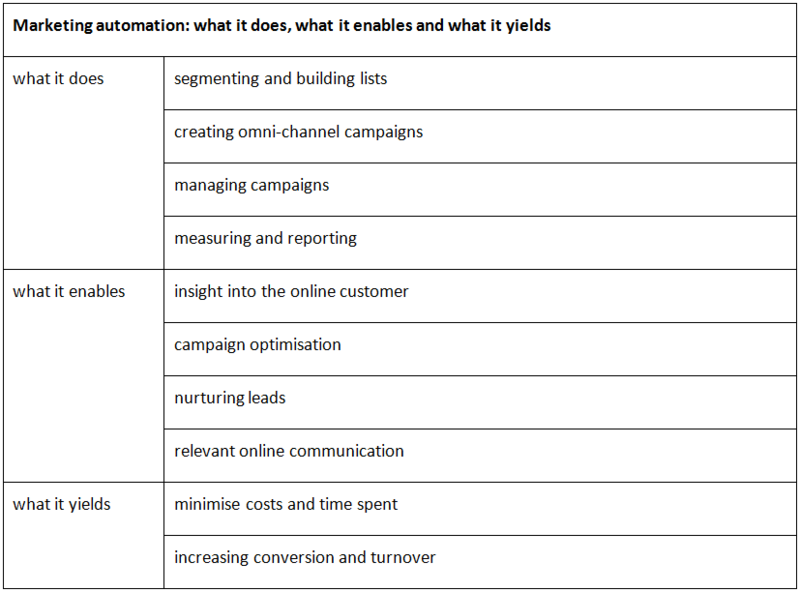 The results of marketing automation vary depending on the organisation and the industry. Large-scale research by hubspot has shown that those who use marketing automation quadruple their turnover, on average. Of course, that isn’t just because of the software. The software also forces organisations to really consider their marketing processes and logical content flows in order to steadily encouraging leads to make a purchase. •	higher conversion and a 10% increase in revenue. Both B2B and B2C organisations achieve the highest possible conversion using email marketing. A 2012 study showed that 44% of the people who receive commercial email did indeed make a purchases because of it. Consequently, budgets for email marketing continue to rise. Marketing automation software enables marketers to achieve maximum results using email marketing by directly engaging with the customers and approaching them 1-on-1 as much as possible.